Please don't ever ride a horse into a Philadelphia bar. You hear about that bikini-clad lady who rode into a South Beach club on a horse the other night? If you haven't, here's the crazy video. Yeah, that didn't exactly go over all too well with Miami Beach officials, who shut down the club, and prompted a police investigation. If you're anything like me, upon hearing the story, you were somewhat surprised that the horse didn't gallop up in that club somewhere in Philly, what with our recent track record of both punching horses and eating their poo to celebrate a sporting victory. Let's dispense with a couple caveats before we get into the purpose of this post. No, it is not nice to ride a horse into a club. It's not legal from an animal-cruelty or health-code perspective, either. No, we do NOT endorse said behavior and implore you NOT to do so at any point in your life. 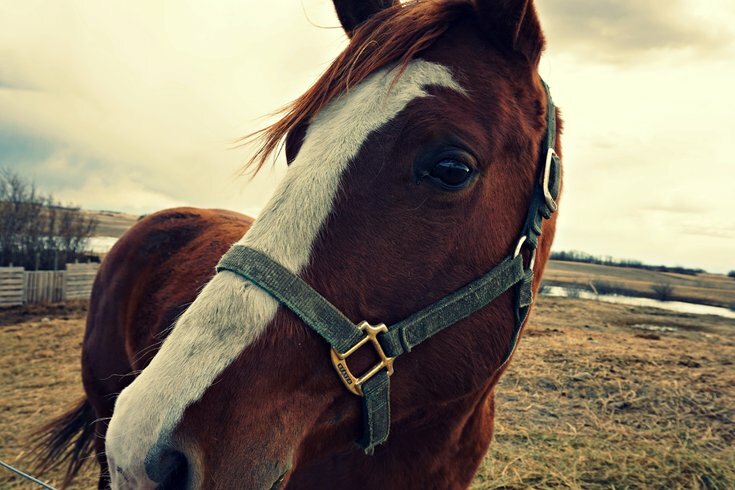 It's not good for the horse, which you could hurt unnecessarily. It's not good for the crowd. And, as the Miami incident proved, it is not good for a club that wishes to remain open for business. Plus, there's this tidbit from a Philadelphia Police Department spokesman: "Anyone who rides a horse into a club will be forced to relocated to a home with a noisy gate for eternity." That'd be rough. Still, the scene got me to thinking about a similar thing playing out in Philadelphia. That was Phase One of the thought process. Phase Two of the thought process? Mulling what bars and/or clubs would it be cool to ride a horse into. Update: After this post went live, we received a wonderful email from Aleicia Phulwani with photographic evidence of the time that she rode a horse to (but not into) Dock Street, which I believe to be in Cedar Park. Sometimes, life affords you an opportunity to ride a horse to the bar, albeit unlike to woman from Miami I have not ridden any into the bar. These opportunities happen when you are in no way, shape, or form dressed for riding, but something something gift horse's mouth. I believe my friend Emily Feder took this photo, but Facebook is make attribution hard to ascertain. This is from about 4 years ago, according to Facebook. Hope it's good for a chuckle. Yes, it was good for a chuckle, and the sharing of this was much appreciated, Aleicia. (Let this also serve as an invitation for others to share horse-riding-to-bar stories as well. 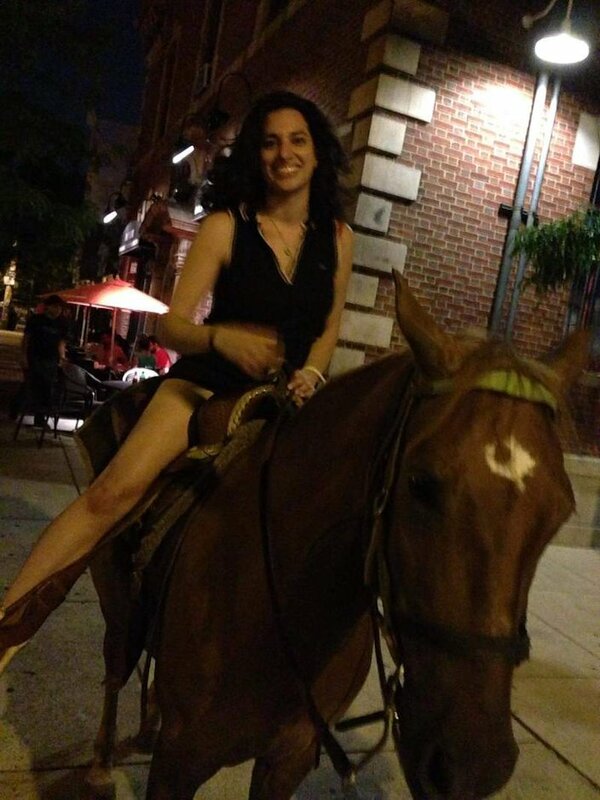 Aleicia Phulwani rode a horse to a bar in Philadelphia one time several years ago, but did not ride it inside. Reiterating that you should NOT do this anywhere – EVER – here's are the Top 10 Bars It Would Be Cool To Ride A Horse Into In Philadelphia. Here's hoping it prompts a future "It's Always Sunny in Philadelphia" episode plot line. 10. Brasil's Nightclub. Old City. I don't know, it kinda resembles the South Beach vibe where this whole thought experiment started. And the neighborhood is the most likely for a bikini-clad patron to frequent, I suppose. 9. Wherever they host the next Diner en Blanc. This one stretches listicle rules, what with it not being a brick-and-mortar bar or gastropub or whatever, but it'd be fun to see people clad in white from head-to-toe stay clean while avoiding a horse. 8. The Draught Horse Bar & Grill. Temple University. C'mon. This was a gimme. 7. The Barbary. Northern Liberties. Change the "Y" in the name to an "O," and this spot would be called The Barbaro. RIP Barbaro. 6. Boot & Saddle. South Philadelphia. Much like with the Draught Horse, they probably won't hit you with a cover charge to see a show. 5. The Pub on Passyunk East. Passyunk Square. This place really couldn't handle an equine invasion. Still, if what a gentleman named Mike Bradley tweeted this weekend is true, that's what they deserve for skipping Meek Mill's "Dreams and Nightmares" on the jukebox. Pub on Passyunk East just skipped Dreams and Nightmares on the jukebox and now I'm refusing to pay my tab. 4. Spruce Street Harbor Park. Penn's Landing. This is an outdoor venue. The pony would be more comfortable here. 3. Jax. Parx Casino. Bensalem. There is a racetrack not too far from this bar. And stables. And comfort food for horses. Plus, there's a casino, so you could cover your bail money with the proceeds from people betting how long it would take you to get locked up for your offenses of both criminal and moral varieties. 2. Lucky Red. Sugarhouse Casino. This one lacks the horse population near Jax. But it tops the Parx location because you wouldn't need to hitch a horse trailer to your vehicle and cruise up I-95 first. 1. Xfinity Live. Stadium District. There is ample room to graze in what's become the boozy hub of the Philadelphia sporting scene. Plus, there's a huge park nearby into which you can flee and let the horse frolic in its natural habitat.